FlyDubai, the low-cost carrier based in Dubai must have one of the nicest fleets of aircraft, as well as pretty decent on-board customer treatment compared to other low cost carriers. Apart from a few minor issues, I have rarely had a problem with the carrier on-board a flight and I have used it extensively even after their broadly-covered crash a year ago. Yesterday I received this promotional offer in my inbox. It seemed like an interesting offer and made sense since the Flydubai business class was introduced a couple of years ago but on many flights I have flown the seats are not used. Shortly after seeing this message “Just book a return ticket in business class and you’ll get the second ticket for free”, I did a search on their website and could not get the discounted seats, the price displayed was for 2 full-priced seats. 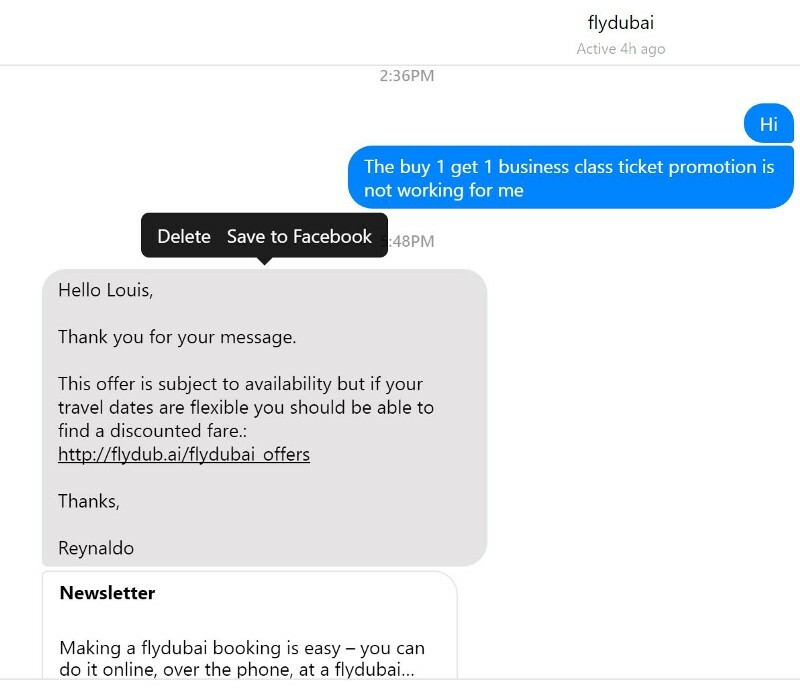 Having no Twitter account and generally bad email response times I posted a message on the FlyDubai Facebook page but got no replies. I then started a chat using their Facebook page messenger link to inquire about the issue. So basically to be able to qualify for the discount you have to do a an extensive (someone want to build a script for that?) search of flight combinations to check which combinations work. No thanks! 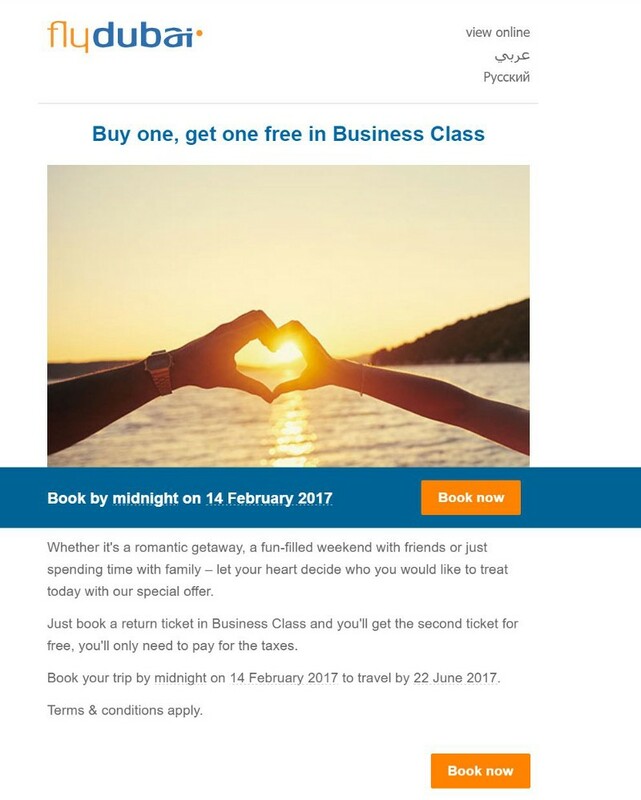 Recently FlyDubai has been sending so many promotional emails that all offers have lost their meaning. 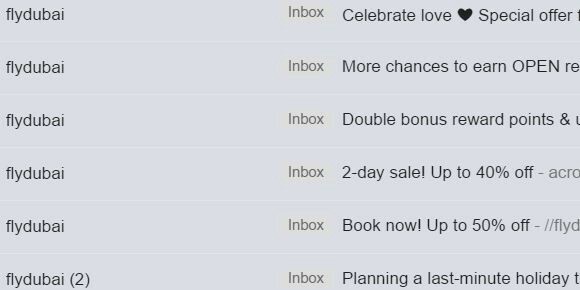 You cannot promote a limited offer if 2 days later there’s another limited offer. Customers are not stupid and they wise up to this tactic. First people stop being excited about the offer, second, on the company side, the offers become less enticing as it’s not possible to have a deep discount every day. If you have spent time to create a marketing or revenue uplift campaign, sent it to the customers, had them open it, read it, and then they actually want to take advantage of this offer, why not make it easy for them to do so? Do not fail at converting! Hello Flydubai? This is the 1990s calling! 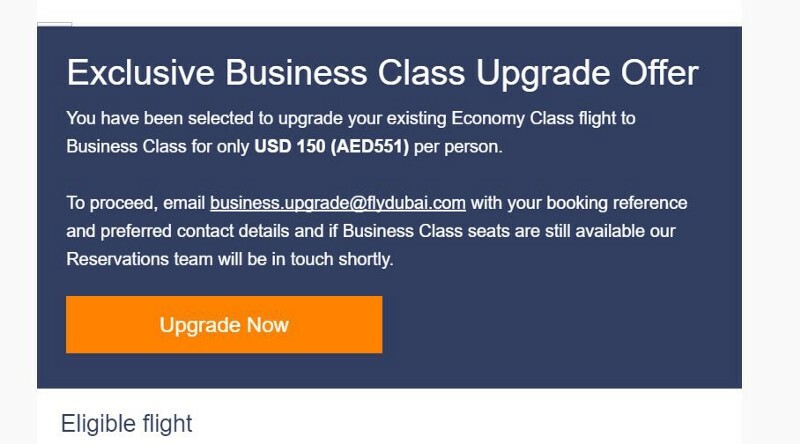 When I click on this “Upgrade Now” button instead of being able to select my business class seat and pay for the upgrade, an EMAIL is generated requesting the upgrade. No one knows how the payment would be done (most probably an agent would call me and would have to do it on the phone). When did I receive a reply back from Flydubai for the email I sent? After I arrived at the destination. Fail! If you are in a startup, you don’t have the luxury of making these mistakes. Every friction you add to the customer experience will decrease your likelihood of success. You are not 95, your many careers are just starting! Previous articleMeet The AstroLabs Team!